The location for the Sermon on the Mount—the Beatitudes—is between the ancient cities of Magdala, the home of Mary Magdalene and Capernaum, the fishing town on the northern shore of Lake Gennesaret. Magdala is a recent archeological find that has great significance. The population of the town was around 10,000 people and it was the place where archeologists believe most of the fish caught in the Sea of Galilee was processed for consumption and/or salted for storage. It is reasonable to consider that this was a town of some affluence. This site also contains the remains of one of the few undisturbed synagogues from the first century. It is very likely that Jesus himself taught and studied at this synagogue. 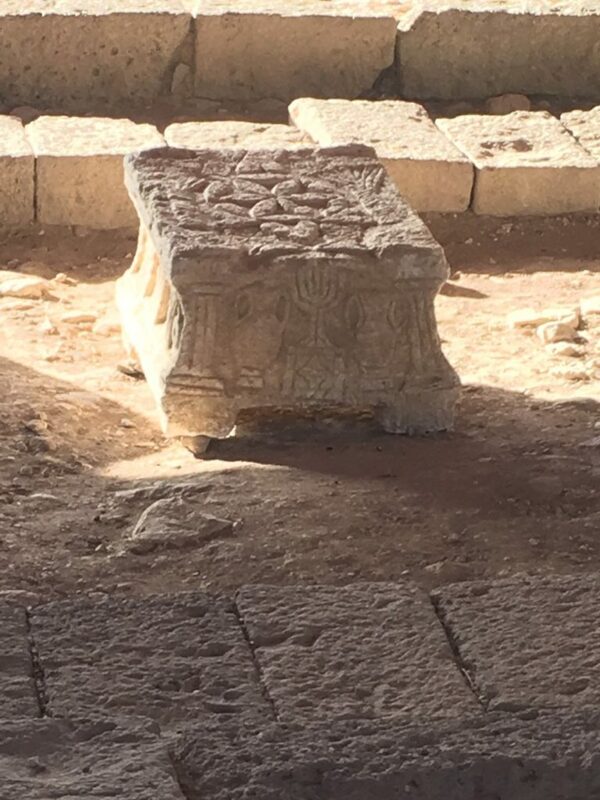 The Magdala stone is a carved stone block unearthed by archaeologists in a Galilean synagogue, dating to before the destruction of the Second Temple in Jerusalem. Capernaum was where Jesus lived when he moved from Nazareth. This is also where archeologists found many millstones (see Matt. 18:6). In fact, there were so many millstones in the ruins, archeologists concluded they were likely manufactured in Capernaum. So we have two towns, both possible locations that provided a highly needed service or industry in the first century. Jesus likely spent a lot of time with residents from these two towns in the first thirty years of his life as he worked with Joseph and others. Most of us refer to Jesus as a carpenter, which we’ve interpreted from the verse, “Isn’t this the carpenter’s son?” (Mat. 13:56). The Greek word, tekton, is more accurately rendered as craftsman or builder. Looking over the cities we visited, it’s clear Jesus could have been a stonemason as well as someone who worked with wood. Which job he held is irrelevant; the point is Jesus had likely done work for many of the people in Magdala and Capernaum before he started his ministry. Due to his trade, it is also likely he was known and respected. Thanks much for this fascinating archeological insight!